We finally got Jeff Williams to model his Barihunk t-shirt in anticipation of his upcoming performance of Gilbert & Sullivan's The Pirates of Penzance at the Young Victorian Theatre Company in Baltimore. Williams, who is singing the Pirate King grabbed some photos with castmate Spencer Adamson, who is singing Samuel. The show opens Saturday July 11th and if you use the promo code July11 for opening night, you'll receive 30% off of your tickets. 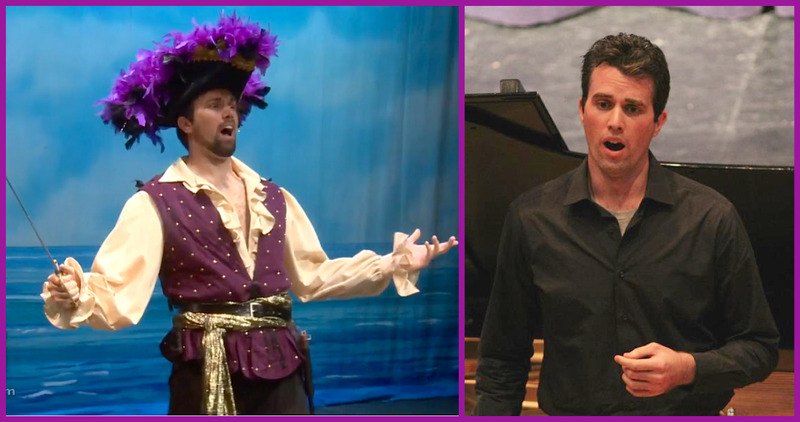 You can watch Jeff Williams singing the Pirate King Song ("I am a pirate king") on Baltimore's CBS affiliate WJZ. The Young Victorian Theatre Company has been producing shows in Baltimore for 45years and it's the city's longest-running summer musical theater. They are dedicated to performing the works of Gilbert & Sullivan and they attract some of best in young musical talent from across the country. Jeff Williams is a former Nashville Opera Mary Ragland Young Artist and a Seagle Music Colony Young Artist. He has also been associated with the John Duffy Composers Institute and Virginia Arts Festival in Norfolk, Virginia for many years premiering operatic works of living operatic composers. Williams appears on Albany Records in Thomas Sleeper's series of operas, Einstein's Inconsistency, and Michael Dellaira's The Death of Webern to be released later this year. Upcoming engagements include the premiere of George Mabry's Voices, the Mandarin in Turandot with Nashville Opera, performances of Evan Mack's Angel of the Amazon and Roscoe, the premiere of Jeffrey Wood's Different Bodies with the Gateway Chamber Orchestra, and Brahms: Biography in Music with LyricFest. Spencer Adamson hold a Bachelor's degree in Voice Performance from Westminster Choir College, with graduate work at Indiana University, Bloomington. He has performed the roles of Tonio in Pagliacci and Alfio in Cavalleria Rusticana with HUB Opera Ensemble in Hagerstown, Maryland. performs in outreach programs with Baltimore Lyric Opera bringing opera to Baltimore's elementary schools. Additional performances are on July 12, 16, 18 and 19. Tickets and additional cast information is available online. They're pretty cool. :) Arghhh!